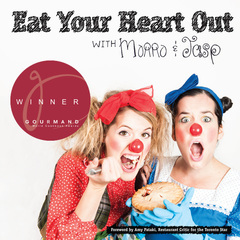 Our yummy and emotionally inspired and inspiring cookbook, Eat Your Heart Out With Morro and Jasp makes the perfect anytime gift. It won a Gourmand World Cookbook Award and is currently on sale through our publishers at a bookstore near you! We got a grant from the Canada Council to be creators-in-residence at Factory Theatre, so we are working away in our secret detective office on our Untitled Sherlock Holmes Adaptation. Our video game, Morro and Jasp: Unscripted, is NOW AVAILABLE on a smartphone near you. Check it out HERE.